Conservatives always complain about the 'Welfare Queens' and the excessive benefits of the public sector workers. 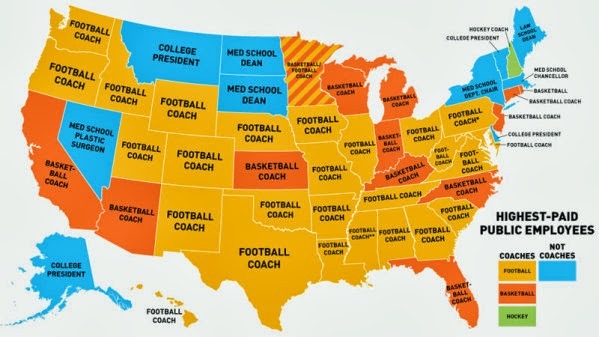 Graph below shows the highest paid public sector workers in the US. For one I'm in favor of cutting expenses with most of these privileged public sector workers. I just wrote a review of Daniel Stedman Jones's book Masters of the Universe: Hayek, Friedman, and the Birth of Neoliberal Politics, which will be published in the Social Science Journal later this year. So I don't intend to say to much here. But one thing that was striking about the rise of the post-New Deal Neoliberalism, starting with the Mont Pelerin Society, is that they tended to group in organizations that were closed, not particularly democratic, and somewhat dogmatic, with a single or unique view on the relevance of market mechanisms, which allowed no space for individual dissent on where to draw the line between markets and the state. One should not be surprised that Friedman and Hayek provided qualified support for such examples of closed societies as Pinochet's Chile. By the way, on Friedman's forecasting abilities one quote from the book, a letter from Friedman to Samuel Bittan, is worth noticing. He predicted that: "destruction of its [Britain's] democratic society ... would come from the left." Yes, because Wilson and Callaghan were revolutionaries in disguise! Figure below shows the most recent data from the IMF's Currency Composition of Official Foreign Exchange Reserves (COFER). 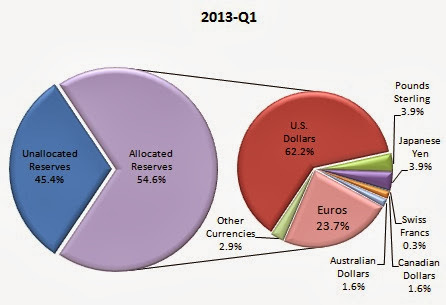 The dollar remains more or less in the same place with 62% of allocated reserves being in dollars. The euro is a distant second. Data available here. For more read this. By the way, the graph provides a short list of the limited number of currencies that do serve as international reserve currencies. Most only marginally. We argue that a fundamental difference between Post-Keynesian approaches to economic growth lies in their treatment of investment. Kaleckian-Robinsonian models postulate an investment function dependent on the accelerator and profitability. Some of these models rely on the importance of profitability, captured by the profit share, to make the case for profit-led growth. For their part, Kaldorian models place the emphasis on the accelerator. More important, investment is a derived demand; that is, it is ruled by the adjustment of capacity to exogenous demand, which, in turn, determines the normal level of capacity utilization. In our view, the Kaldorian approach is better equipped to deal with some of the issues relating income distribution to accumulation with effective demand in the long run. We develop a Kaldorian open-economy model to examine the conditions under which an increase in real wages can produce profit or wage-led growth, showing that the limit to a wage-led expansion is a binding external constraint. The role and limitations of wages as a determinant of growth are further examined through spectral techniques and cycle analysis for a subset of developed economies. The evidence indicates that real wages are positively related to growth, investment, and capacity utilization. It also highlights the role of finance in sustaining expansions, suggesting that debt-led growth should not be identified with profit-led growth. There is a general consensus that annual fiscal policy fights hurt the economy’s recovery. Many people, however, get the story quite wrong. It has nothing to do with 'uncertainty'; rather, it's the unfortunate fact that the brouhaha, in the final instance, leads to smaller budget deficits, i.e. 'austerity', significantly diminishing the level of effective demand. 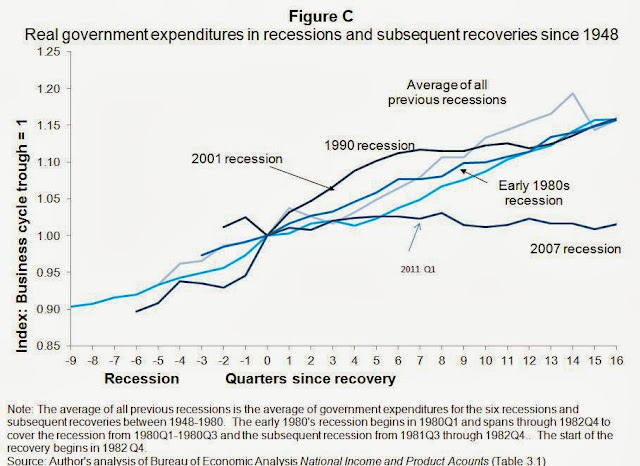 It’s austerity that is reliably damaging to recover efforts, not uncertainty. And each year’s fiscal drama has tended to produce another dose of austerity. The very large reduction in the budget deficit between 2009 and 2012, combined with the extraordinarily slow pace of recovery over this same time period is not a coincidence. This should be a lesson to evidence-based policymakers: You should be much more worried about accepting more austerity as the price of ending the fiscal drama than any damage caused by the drama itself. It is worth remembering that according to Eichengreen (1996, p. 25) “the most influential formalization of the gold-standard is the price-specie flow model of David Hume. Perhaps the most remarkable feature of this model is its durability: developed in the eighteenth century, it remains the dominant approach to thinking about the gold standard” (for a critique go here). The idea is that, at least in a fixed exchange rate regime, inflation and deflation do all the work of adjusting the balance of payments (BOPs). 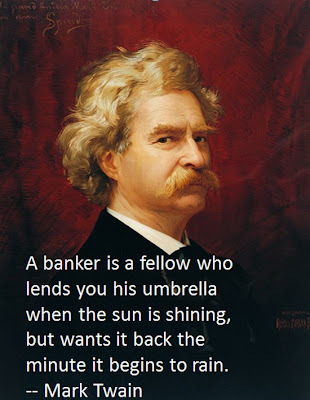 Modern versions add credibility and all that (which includes austerity) for the stabilizing flows of capital to work. Why do I bring this up? 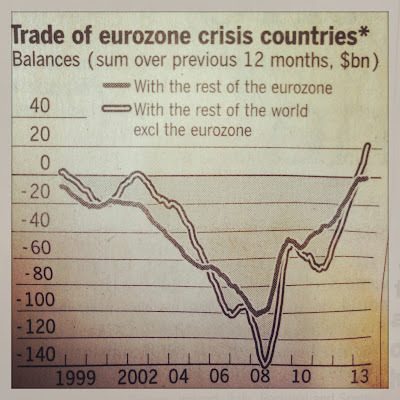 Because of Martin Wolf's column (subscription required) in the Financial Times today, which has the graph below. 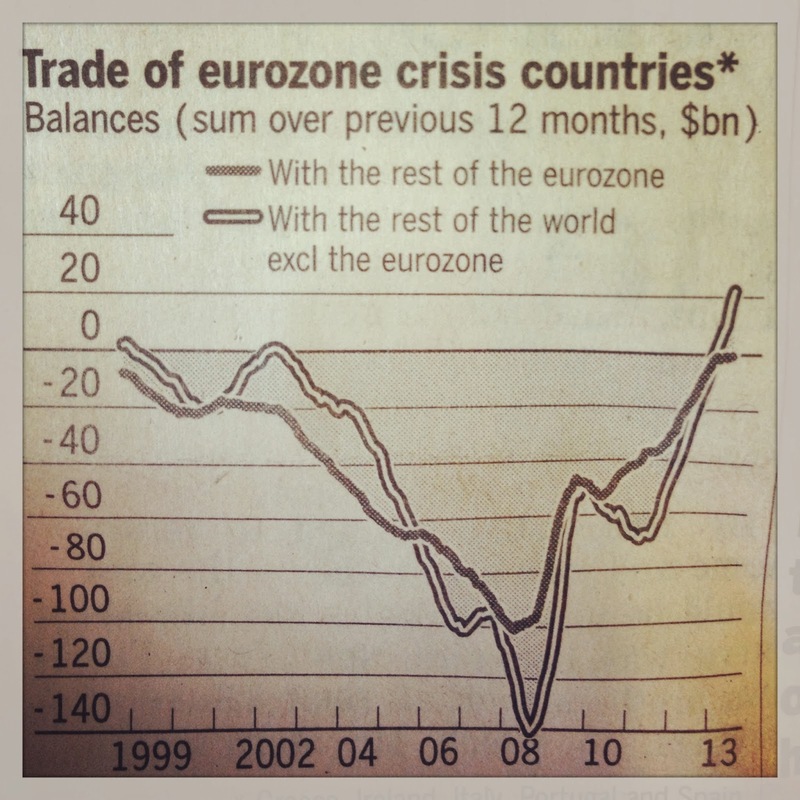 Note that the countries in crisis, Greece, Ireland, Italy, Portugal and Spain have already adjusted their BOPs (in this case their trade balances). Yet the adjustment is more Keynesian than Humean, or to be more precise, it follows the analysis of A.G. Ford, who argued that peripheral countries, like Argentina, adjust their current account deficits with a good old recession not by lowering domestic prices. And yes, Wolf is right, the specie-flow would only work in a parallel universe. How stimulative has fiscal policy been? Not much. 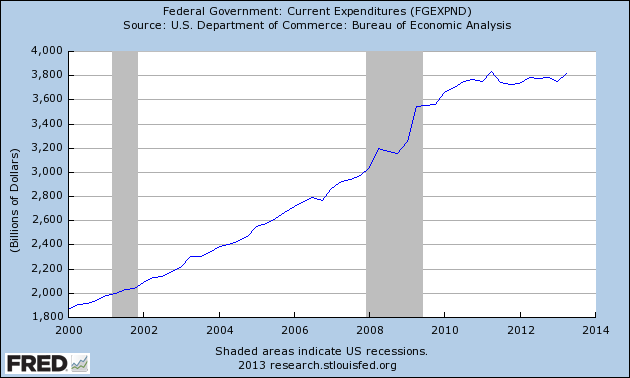 Particularly after the initial stimulus spending came to a halt, as you can see in the figure below. In part this is the result of GOP obstructionism, but also follows Obama's early move to emphasize a balanced approach to the deficit and debt 'problem,' meaning higher taxes and lower spending. Now, it seems, the consensus is that the shutdown will fail, but that does NOT mean that there is more stimulus in the pipeline. So we'll move to the next menace soon, the debt ceiling. Again. 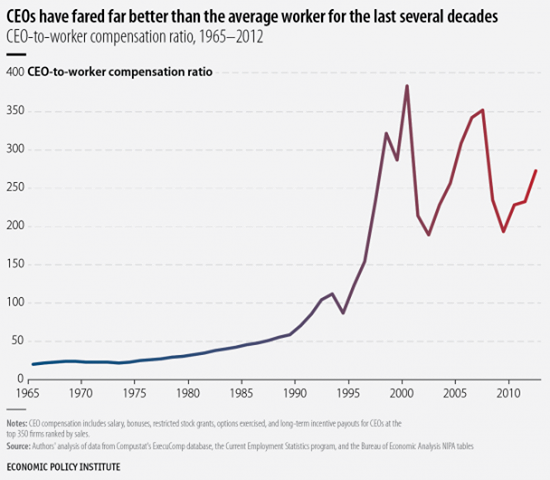 As EPI noted in this recent paper on the ratio of CEO to average worker pay, from 1978–2011, CEO compensation grew more than 876 percent, more than double the growth of the stock market and remarkably faster than the growth of annual compensation of a typical private-sector worker, up a meager 5.4 percent. The increased divergence between CEO pay and a typical worker’s pay over time is revealed in the CEO-to-worker compensation ratio, as shown in the figure. This ratio measures the gap between the compensation of CEOs in the 350 largest firms and the workers in the key industry of the firms of the particular CEOs. Live-streamed Fed talk w/ James Galbraith, Lord Turner, and Matías Vernengo tonight 6:30 p.m. Go here. The BIS Triennial Central Bank Survey shows that over the last three years the position of the dollar as key currency has become more dominant. 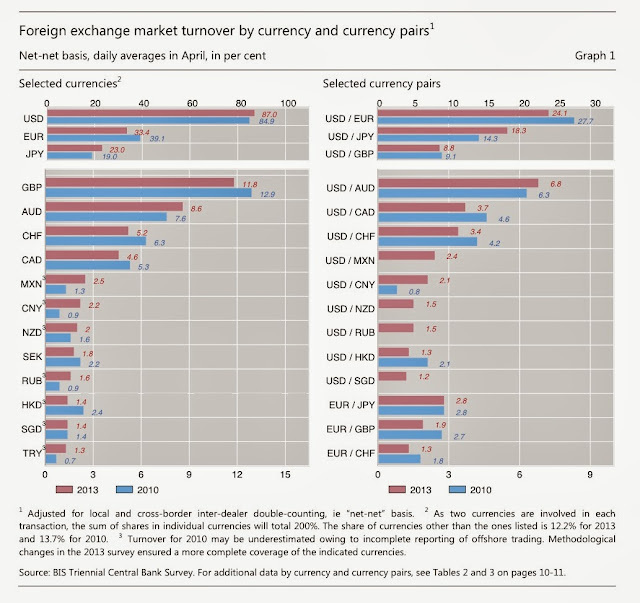 The figure below shows the turnover by currency and currency pairs. You can see that the dollar was on one side of the operation 87% of the time, compared to 84.9% three years ago. The euro has lost some ground. Also, the average daily turnover in foreign exchange markets in April was around US$ 5.3 trillion. Andrés Velazco, finance minister under Bachelet (and you wonder why the economic policies of Socialist governments are all but), tells us that according to Diaz-Alejandro "the combination of high commodity prices, low world interest rates, and abundant international liquidity would amount to economic nirvana for developing countries." And he goes on to suggest that all growth in the region over the last decade was fueled by external conditions, which now are basically gone. While Diaz-Alejandro is certainly correct about the positive effects of the unlike external conditions it is far from clear that growth during the last boom in Latin America is only explained by external conditions, and that we should expect necessarily higher international interest rates and/or lower terms of trade. Yes the Fed announced that they will end QE, and that (even the speculation that would happen) led to some run to quality, with more demand for American bonds, and depreciation of developing countries currencies. But the statement of the Federal Open Market Committee (FOMC) is very clear that to: "support continued progress toward maximum employment and price stability, the Committee today reaffirmed its view that a highly accommodative stance of monetary policy will remain appropriate for a considerable time after the asset purchase program ends and the economic recovery strengthens." This is a topic we already discussed in the blog before. In particular while lifting the external condition allows for faster growth, it's clear that certain countries grew faster than other, irrespective of the size of the positive effect on terms of trade (see here). Also, it is not clear that the growth in commodity prices is all related to a booming demand, particularly in China. As noted before, Franklin Serrano there are structural causes, associated to the supply side, the long term costs that might be part of the explanation for the terms of trade trends. In one thing Mr. Velazco is correct, "conservative governments viewed industrial promotion as some dirigiste relic from the past, and avoided it," and left of center government were not particularly good at promoting industrial development. I'm glad he does not think industrial policy is a mistake. In that sense, if the economies of Latin America grow less it might a for their inability to expand demand (contrary to the 'good macro' policies advocated by Velazco), and for their inability to diversify exports and reduce the balance of payments constraint, rather than simply because the external conditions worsened. The graph below was prompted by a question to the Society for the History of Economics (SHOE) sent by Steve Kates, and by a response by José Menudo, on the use of the French term entrepreneur in English. According to Prof. Menudo the first use in English is by Stuart Mill, in 1848. Note, however, that more widespread use only takes place considerably later in the 1920s. The alternative used before, undertaker, has other uses as well, but the comparison might still be useful. Brief post, prompted by comment on previous post. 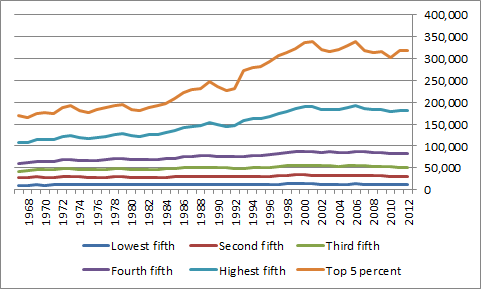 Below the Mean Household Income Received by Each Fifth and Top 5 Percent. Note that in real terms the bottom has had no gains since the early 1970s really. And that's true of the lowest three quintiles. 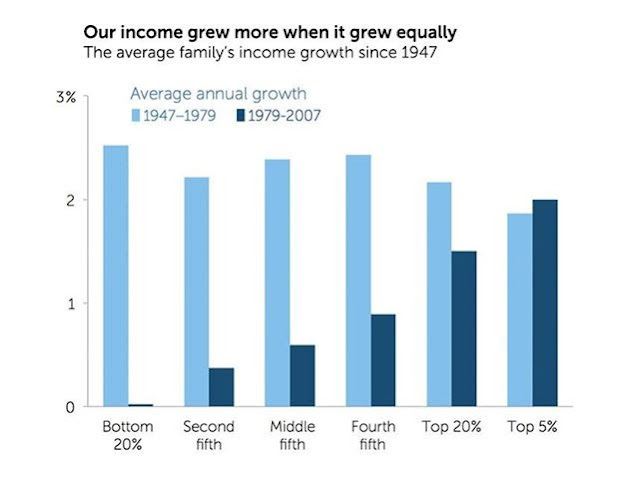 Only the two highest quintiles have seen some increase in income, but at least at this level of aggregation since the 2000s there is no growth at the top too (if you open up the top 5 percent, things might change). Data here. The US Census released new income data, which revealed more evidence of the widening income gap between the rich and poor, prolonging the trend of the last 40 years. See more data here and here. Increasing share of the economy is organized around financial capitalism, where capital market actors actively manage their claims on wealth creation and distribution to maximize shareholder value. Drawing on four case studies of private equity buyouts, this article published in the British Journal of Industrial Relations challenges agency theory interpretations that they are ‘welfare neutral’ and show that an alternative source of shareholder value is breach of trust and implicit contracts. 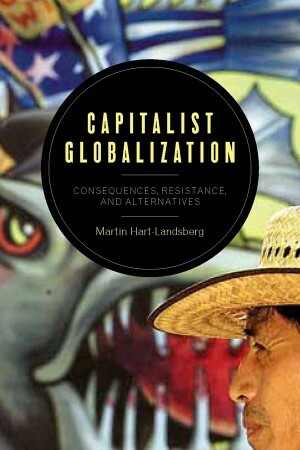 It also shows why management and employment relations scholars need to investigate the mechanisms of financial capitalism to provide a more accurate analysis of the emergence of new forms of class relations and to help us move beyond the limits of the varieties of capitalism approach to comparative institutional analysis. Note: The light blue is the average annual growth rate during the earlier time period, and the dark blue is the average annual growth rate during the later time period. 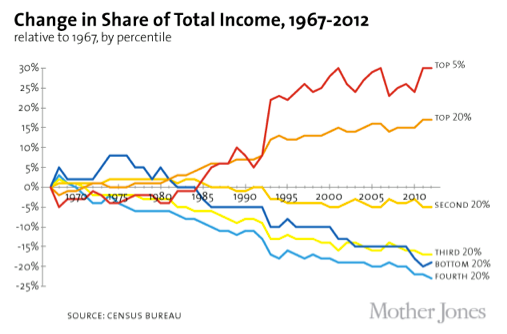 For each pair of bars represents a different income quintile. A new edition of the Elgar Companion to Post Keynesian Economics edited by John King is out. See more here. Robert Skidelsky at a Liberty Fund event, not too long ago. Note that in the opening remarks he says: "I'm going to talk about the conditions of liberty, which seems a good topic of conversation for a Liberty Fund event. Owing to the hazards of the weather, I find myself the sole representative of common sense this afternoon." Not sure what the weather conditions had to do with it, but I must agree, given the venue. The whole thing here. My only major disagreement is that I really do not think that Hayek is the great rival of Keynes, or even one of the major economists of the 20th century, given his contributions. On the neoclassical front, Hicks, Modigliani, by bringing neoclassical results in the long run, but opening space for Keynesian policies in the short run, associated to rigidities an imperfections, and even Friedman, with the return of the concept of the natural rate, were more relevant than Hayek. Who was Keynes great rival? While he was alive his debates were with his Cambridge peers, Pigou and Robertson, more than with Robbins, Hayek and the LSE economists. In fact, a good chunk of the younger LSE economists became, in different degrees, Keynesian (e.g. Hicks, Kaldor, Lerner, and even Shackle). But if I had to say, his great rival was himself, which would probably fit his very elevated sense of self-worth. In particular, his inability of getting rid of marginalist (neoclassical) elements of his theory is what ultimately opened the door for the Neoclassical Synthesis. The figure is in Purchasing Power Parity (PPP). One should take these kind of comparisons with a certain caution. At any rate, the US seems to have a lower rate than most Western European countries and Australia. Source here. Paul Krugman commented on the NY Times piece on Wynne. There are many little incorrect interpretations, which derive from his lack of understanding of the history of ideas. First, he equates Wynne's model with the old hydraulic Keynesianism (i.e. Neoclassical Synthesis) of Phillips (of Phillips curve fame, but also of the hydraulic model of the British economy). Nothing further from the truth. Wynne came to economics via P. S. W. Andrews, one of his two most influential teachers at Oxford (the other being being Isaiah Berlin). Andrews and the full cost price authors that were part of the Oxford Economists' Research Group (OERG), under the leadership of Roy Harrod, and were in general more concerned with practical applications than with theoretical first principles. That influenced the way Wynne developed his skills as a modeler at the British Treasury, before being taken by Nicholas Kaldor, to head the Cambridge Department of Applied Economics (DAE), where he built together with Francis Cripps the Cambridge Economic Policy Group (CEPG). Note that conventional hydraulic models, including the sort of Cowles models like the Klein-Goldberger model of the US economy, put great emphasis on the estimation of parameters based on certain simplistic macro behavior. Wynne took a very different approach to modeling than Klein-Goldberger. He was more concerned with what he referred to as 'model architecture' than with parameter estimation. The architecture, which was careful about stock-flow consistency, showing that everything came from somewhere and went somewhere so to speak, also imposed a clear causality structure, which determined most of the results. In fact, Wynne believed that significant variations of the parameters might not greatly influence the end result of the model, which was used for simulations and scenarios that helped to understand how the economy functioned, rather than for strictly forecasting purposes. Krugman then says these models were abandoned because they failed in the face of the Great Inflation of the 1970s, and because they did not deal with consumption in a coherent way. Here again he is wrong. First of all, Wynne's models had no trouble dealing with the inflation of the 1970s, correctly pointing out the effects of oil prices, devaluation, and wage pressures from the cost side rather than demand pull views, and he was one of the few that correctly foresaw the big recession that the Thatcher policies would cause. On consumption the notion that Friedman somehow is better than Duesenberry and the relative income approach of other old Keynesians goes to show how limited is Krugman's understanding of his own tradition in the field (for more go here). Note that he believes that New Keynesians are just grafting a more sophisticated behavioral decision making approach to old Keynesian stories, without owing up to the limitations that the Old and New Keynesian models, based on rigidities and imperfections to avoid the tendency to the natural rate. Wynne's model, in the Kaldorian tradition, with a supermultiplier determining growth, and with the Oxford pricing tradition determining prices, was free of the main limitations of the Hydraulic tradition to which Krugman belongs, whether he understands it or not. That is why Jonathan Schlefer, from the NY Times, is correct in suggesting that rebuilding macro on the basis of Wynne's work would make more sense. On a funny note at the end, Krugman reveals his misconception about the role of old ideas in the history of science, and economics in particular. He says: "it is kind of funny to see a revival of old-fashioned macro hailed, at least by some, as the key to a reconstruction of the field." In his view, old ideas are only relevant if you can formalize them in modern garb, but are not a source of forgotten and incorrectly discarded knowledge that are better prepared to understand how the economy works. The limitations of the 'great economists' of today, make the loss of economists like Wynne all the more painful. PS: Full disclosure, I'm quite biased on this topic, having worked for Wynne at the Levy Economics Institute for two years in 1997-98. PS': Two additional posts by Unlearning Economics and Philip Pilkington and a link by Lars Syll (h/t for the link to Unlearning). Well okay, there are other more urgent crises, but it is worth noticing that PhDs increasingly end up as adjuncts, with significantly diminished job opportunities. And that at a time that tuition is skyrocketing (in part as a result of Baumol's disease), and making 'non-profit' organizations quite wealthy. And yes it does seem that "adjuncts are keeping the system afloat, and work in indentured servitude." See the full info-graphic here. A brief piece of Jamie's presentation at the Better Markets Event: "Five Years On, Learning Lehman's Lessons from the Panic of 2008." For the whole video go here. In an interview here (in Spanish), Carlos Ominami, ex-finance minister during one of the Consertación administrations, argues that Chile did not really have one model after the coup against Allende, but a sequence of policies, not always coherent, that cannot be reproduced by other countries. Further, he points out that the Chicago Boys did NOT privatize Codelco and actually increased the government revenue associated to nationalized copper. He also notes that the infamous privatization of the pension system was a complete failure, "the marketing was the best thing about the pension system" according to him, and that forced later Socialist governments to re-introduce a State run system. In other Chilean news, Esteban Pérez Caldentey gave a talk (here; in Spanish too) at the Universidad de Chile on heterodox (post-Keynesian) approached to economics, opening the door in a traditionally mainstream environment for broader and more pluralistic views. PS: On Chile model you can read James Cypher's paper in Dollars & Sense here. Recent estimates of the U.S. economic gains that would result from the proposed Trans-Pacific Partnership (TPP) are very small — only 0.13 percent of GDP by 2025. Taking into account the un-equalizing effect of trade on wages, this paper finds the median wage earner will probably lose as a result of any such agreement. In fact, most workers are likely to lose — the exceptions being some of the bottom quarter or so whose earnings are determined by the minimum wage; and those with the highest wages who are more protected from international competition. Rather, many top incomes will rise as a result of TPP expansion of the terms and enforcement of copyrights and patents. The long-term losses, going forward over the same period (to 2025), from the failure to restore full employment to the United States have been some 25 times greater than the potential gains of the TPP, and more than five times as large as the possible gains resulting from a much broader trade agenda. "If the economics profession takes on the challenge of reworking the mainstream models that famously failed to predict the crisis, it might well turn to one of the few economists who saw it coming, Wynne Godley of the Levy Economics Institute. Mr. Godley, unfortunately, died at 83 in 2010, perhaps too soon to bask in the credit many feel he deserves." Note that he did see the 2008 crisis, which basically confirmed several of his predictions. 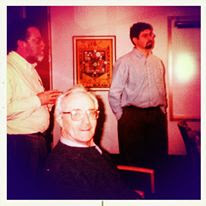 PS: Pictured above Lance Taylor, Wynne Godley and yours truly, at my defense in 1999. Something I have not posted about, but that deserves attention is the organization of fast food workers this summer, and the series of walk outs to demand a living wage of $15 per hour (see here, for example). 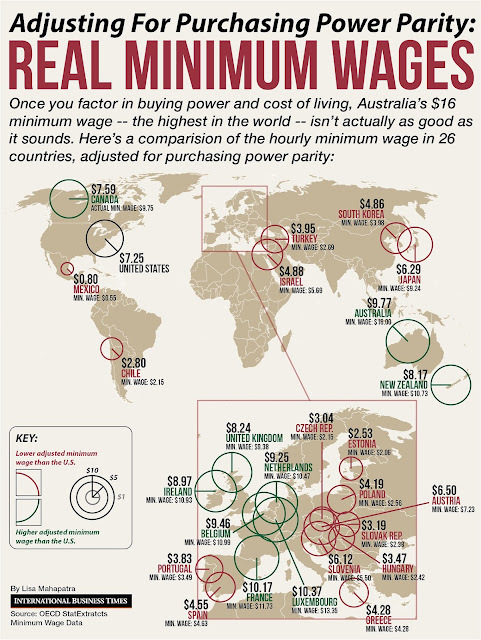 Note that the current minimum wage is less than half at $7.25 per hour, last raised in 2009. 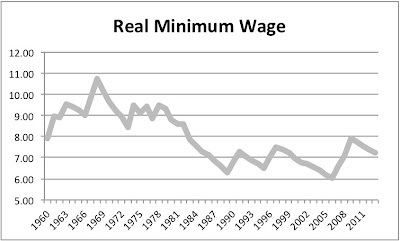 Figure below shows the real value now is well below the average of the 1960s and 1970s (data for nominal minimum wage here). 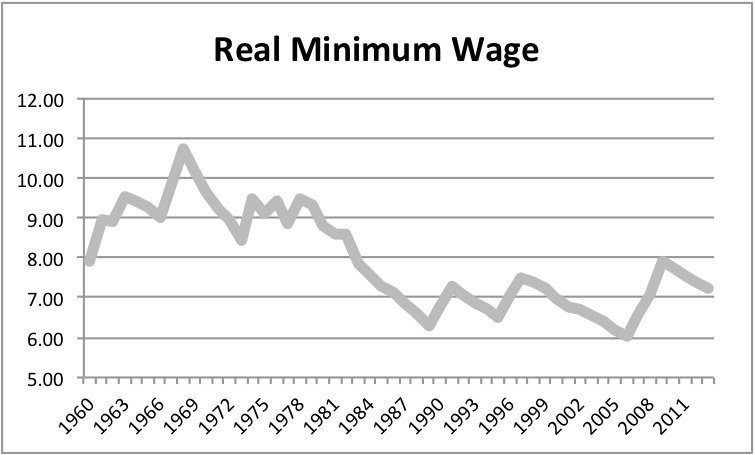 Since the 1980s the real minimum wage has fluctuated at a lower level. One can only hope that fast food workers, with the support of the Service Employees International Union (SEIU), manage to obtain some concessions from junk food corporations. For a discussion of the Living Wage see this paper by Bob Pollin, and his book (here). PS: Only recently I've learned that Henry Ford's famous $5 a day wage (which would be more or less $14 per hour today), which went together with reduction of work time to 8 hours per day, was controlled by the Sociological Department, which required workers not to drink, that they saved money, that they attended church, that they proved a record of saving part of the wages, and of course it was for married men, not for singles or women, since that would not lead to family values. It was also part of a broader program to make good American citizens of the immigrants in his factory. While some progressives actually liked Ford's program, like the institutionalist economist Commons, others like the radical John Reed were not convinced. For more go here. Globalization, surely one of the most used and abused buzzwords of recent decades, describes a phenomenon that is typically considered to be a neutral and inevitable expansion of market forces across the planet. Nearly all economists, politicians, business leaders, and mainstream journalists view globalization as the natural result of economic development, and a beneficial one at that. But, as noted economist Martin Hart-Landsberg argues, this perception does not match the reality of globalization. The rise of transnational corporations and their global production chains was the result of intentional and political acts, decisions made at the highest levels of power. Their aim—to increase profits by seeking the cheapest sources of labor and raw materials—was facilitated through policy-making at the national and international levels, and was largely successful. But workers in every nation have paid the costs, in the form of increased inequality and poverty, the destruction of social welfare provisions and labor unions, and an erratic global economy prone to bubbles, busts, and crises. Free Exchange, one of the The Economist's blogs, had a post recently on the secular declining prices of commodities. The post suggest that there is significant evidence in favor of the Prebisch-Singer Hypothesis (PSH), based on an IMF paper (available here). Note that the notion that there is something correct about the Prebisch-Singer Hypothesis is not really news. José Antonio Ocampo has written several papers recently (see here and here) showing that overall terms of trade for commodity producers did not go well, particularly in two periods the 1930s, and the 1980s, which drive the negative long-term trend. But it is true, as we noted with Esteban Perez (see here), that many respectable authors still suggest that PSH must be wrong. Note that while Prebisch did read Marx, and early in his life he considered himself a Socialist, it is far from clear that he can be referred to as Marxist, or suggest that PSH is a Marxist theory (for more on Prebisch see this review of his recently published biography). In fact, many interpretations are compatible and sometimes based in neoclassical suppositions. Prebisch actually defended the idea of declining terms of trade in a way that is really compatible with classical (meaning surplus approach and Marx) views on long-term price determination. He suggested in his famous 1949 paper that the cause of tendency of commodity prices to fall with respect to manufactured goods prices was related to wage setting in the center and periphery. In the boom wages went up in the center, but not so much in the periphery, since industrial workers in the center were organized and could demand higher salaries, while that was not possible for the agricultural and mining workers in the periphery. In the recession, in turn, while wages fell in the periphery, they did not in the center. It was the fall in wages in the periphery, associated to the weak labor force that led to lower prices of commodities. Class conflict, and not just technological change (or patterns of demand, as in some explanations of PSH), was at the heart of the asymmetries between the center and the periphery. Hence, industrialization in the periphery, and the re-organization of the labor force, would imply that more workers in the periphery would be able to keep part of the benefits of higher productivity. Industrialization would be good for the production of the commodity sector, since prices of commodities would go up, with higher wages in the periphery. [For more on Prebisch's views go here]. Note that the classical explanation for long-term prices can be used to explain periods in which the trend for commodity prices was positive too [see for example this video of a talk by Franklin Serrano here]. "the persistence in economic history of the idea that free trade provides the optimal long-run conditions for growth may be a better reason than any other why The Economist still supports free trade today— just as it did 170 years ago." I will not get again into the problems with Free Trade (you can go here and here), but obviously if in the long-term specialization in commodities does not tend to be a good idea, a trade policy that leads to that pattern of specialization cannot be defended. At least not in a coherent fashion! Collecting and synthesizing a series of essays on the political economy of trade and development policy, this book explores the following research questions: to what extent is the global trading regime reducing the ability of nation-states to pursue policies for financial stability and economic growth; and what political factors explain such changes in policy space over time, across different types of trade treaties and across nations? Gallagher presents intriguing findings on the policy constraints on the Uruguay Round, as well as the significant restrictions that the USA places upon the ability of developing nations to deploy a range of development strategies for stability and growth. Many of the entries in this blog directly or indirectly deal with the relation between the old classical authors of the surplus approach and the more radical authors that followed after the Keynesian Revolution (see here, for example). David Fields has pointed out this post by Michael Roberts on Marx and Keynes, from a Marxist point of view (after a debate with someone he refers to as left post-Keynesian). "Keynes and Marx were united in their critique of Say’s law (that supply creates its own demand) as a common starting point for theorising about the possibility of insufficient effective demand and the realisation problem." "But he [Marx] did (like the other classical political economists) expected the economy to always tend towards full capacity utilisation even if he (like Ricardo) theorised about technological unemployment in an economy operating at full capacity utilisation." Actually there is no indication that Marx or Ricardo suggested full capacity utilization. Ricardo's version of Say's Law does not require full employment, and there is no mechanism to bring investment to the level of full employment savings. Investment equals savings by definition, and it might be at a level with significant levels of unemployment and spare capacity. Reductions in the real wage or the rate of interest would not bring about full utilization of resources. That's a concept that appears only with Marginalism. When Roberts comes to his argument, it starts with a discussion of Keynes' political position (saving Capitalism) rather than the analytical elements of his theory. Then he discusses the limits to Keynesian policies, which he narrowly defines as fiscal activism (note that this could have been the position of an Old or New Keynesian, defending fiscal activism on the basis of market imperfections). Roberts misses the radical component in Keynes analysis, which implies that market economies are NOT efficient in the allocation of resources, and that long-term equilibrium could imply unemployment (yes long-term equilibrium unemployment, not disequilibrium, and not short-term unemployment is Keynes' central proposition). Further, Keynes' Principle of Effective Demand requires to be fully operational the abandonment of the neoclassical (Marginalist) theory of distribution, since variations of the rate of interest (or the real wage) do not lead to full utilization of capacity, and are compatible with a coherent recovery of the old and forgotten theories of the classical authors and Marx. So, complementing the postie, Keynes and Marx are united, not only the rejection of Say's Law, but also on the need for an alternative to the Marginalist theory of distribution, one in which conflict is necessary. Keynes didn't get to this point, but understood the need of getting rid of the natural rate of interest concept. And that leads to an abandonment of the neoclassical theory of distribution per force. "Keynes says the crisis comes about through a lack of ‘effective demand’, namely an unaccountable fall in investment and consumption and this causes profits and wages to fall. Marx says: let’s start with profits. If profits fall, then capitalists would stop investing, lay off workers and wages would drop and consumption would fall." This is a variation of the traditional Marxist theory of the business cycle. There are multiple versions, from Andrew Glyn profit squeeze to Goodwin predator prey (which by the way suggests full utilization of resources in his model in Marxo-Marginalist fashion), and many others. All rely, like Roberts above on the notion that the rate of profit (or the profit margin in Marglin and Bhaduri) drives investment. In this case, high employment generates wage inflation which can increase the wage share of workers in output; but this will, in turn, reduce the profits of capitalists and thus reduce future investment and output, leading to a recession. The recession, in turn, reduces labor demand and employment and consequently leads to lower wage inflation or even deflation and reduces the wage share of workers. But as workers wage share declines, then profits increase and, with them, investment and a new boom starts. There are a few problems with this view, the profit-led view of investment, discussed here before (and here). As mentioned before, from a theoretical point of view, it is difficult to justify why a firm would invest, even if the rate of profit is high, if demand is not growing. And, in reverse, why would a firm not invest, and increase its capacity, if demand is growing even if the rate of profit is relatively low. Wouldn't it make sense to keep pace with demand, rather than let the competition take advantage of expanding demand? From an empirical point of view (as noted here, and here) the accelerator principle rules the roost. Finally, note that all of the profit-led based theories of cycles and growth are fundamentally dynamic Say's Law stories, in which savings, determined by profits determine the behavior of investment, and the system fluctuates around a level of output in which worker's bargaining power does not lead to inflation, or in other words stable inflation. That is the so-called Marxist version of the NAIRU (see my previous post on the late Andrew Glynn on the subject; for a relatively recent Marxist defense of the NAIRU see Pollin here; subscription required). As I noted before (and here) there are reasons to be skeptical about the Phillips curve and the NAIRU, in all their versions. "In Marx there is indeed no indication of a tendency to full capacity utilization nor full employment of labour. But the author is right about Ricardo. Ricardo assumed Say's law which means that all that "demand is only limited by production", this DOES imply that investment is equal to and determined by full capacity savings as in Ricardo it is only capital (full capacity) not labor that determines potential output. Ricardo did NOT contemplate "spare capacity" and yes his technological unemployment was based on the fully capacity output not generating enough jobs for the economy to get to full employment. You are right that in Ricardo investment does not adapt to full employment savings. But it does adapt if arbitrarily to full capacity saving." Same issue brought up by PGB below. I conflated full capacity with full employment. Mind you, I suspect that this is what the post-Keynesian author referred in the post was doing, and hence my mistake. "Evidence is accumulating that the president is on the verge of making a very big mistake. Last week John Harwood, of CNBC, reported that a 'Team Obama' source had told him that Lawrence Summers would likely be nominated in a few weeks." "there is an issue of serious corruption. ... Summers’s best friend and foremost protégé, Harvard professor Andrei Shleifer (and Shleifer’s hedge-fund operator wife) attempted in 1996 to steal from better-qualified competitors Russia’s first license to sell mutual funds – all the while leading Harvard’s State Department mission to teach Russians American-style market fair play. The mission was shut down amid much embarrassment after their actions were revealed; the US Justice Department sued Harvard and Shleifer and got its money back. Summers’s role in the affair and the subsequent investigation, heretofore almost completely ignored, presumably is about to get a good going over in the administration’s “vetting” of his candidacy, in the newspapers, and in whatever comes next." Mind you, I'm not sure the appointment of Summers, if it really happens, is a watershed as Warsh suggests. Yellen would pursue similar policies (and both would probably be close to Bernanke's stance on the main issues), even if she would be better, and I would prefer her. They are all New Keynesians, and you should not expect a big difference. PS: Yes Harvard had the spreadsheet mistake, and Keynes is gay and didn't care about the future scandals recently, but one should not forget the Russia consultancy scandal. There will be several obituaries and posts in the next few days about Coase's contributions (see here or here, for example), to the theory of the firm (his 1937 paper here; subscription required), which used the notion of transaction costs, later used by Douglas North and other economic historians, but also central for certain discussions in Industrial Organization, and his famous Theorem (or so-called as McCloskey calls it). He won the Sveriges Riksbank Prize (aka Nobel) "for his discovery and clarification of the significance of transaction costs and property rights for the institutional structure and functioning of the economy." An interesting story is the famous dinner in which the main Chicago economists (including Friedman and Stigler) met for dinner [David Warsh calls it the most famous dinner party in the history of modern economics] with Coase at Aaron Director's home (Friedman's brother in law) and decided that the Theorem was correct. The paper (subscription required) was then published in the relatively new (at that time, 1960) Journal of Law & Economics. I always thought that it was very revealing of the way publications, even peer reviewed ones, take place. Coase had to convince the audience, basically the Chicago School, that his arguments were valid. Don't get me wrong convincing editors and reviewers is always part of the process. What the dinner party makes explicit is that, something that is increasingly true, is that Coase had to convince a group of people that is like minded. There was nobody with an alternative [and I don't mean heterodox or radical] perspective at the dinner party. Maybe I'm wrong, but it seems that Chicago was ahead of its time in excluding alternative views on the basis of ideological purity than other places. That's Milton Friedman's real legacy. PS: I was traveling, and didn't post anything about David Landes death. Brad DeLong had a nice post here. I should say that I liked way more the Landes of Unbound Prometheus, than the one of The Wealth and Poverty of Nations. "The heart of the matter is that when you’re borrowing money you can use it for good things or bad things. You can be doing it in the midst of a recession. If we’re going to invest in green technologies to reduce carbon emissions, that’s good. We also need to ask: what is the interest rate at which the government is borrowing? The U.S. government’s debt servicing today—how much we have to pay in interest as a share of government expenditures—is actually at a historic low, even though the borrowing has been at a historic high. The answer obviously is because the interest rate is so low. When you’re in an economic crisis and you want to stimulate the economy by spending more, does the central bank have the capacity to maintain a low interest rate? In the United States, the answer is yes. In the UK, the answer is yes. Germany, yes. In the rest of Europe, no. If you can borrow at 0%, go for it. If you have to borrow at 9%, that’s a completely different world." A Review of Edgar Dosman's The Life and Times of Raúl Prebisch. 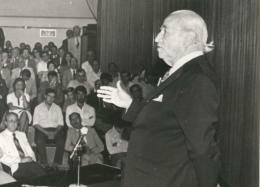 "Raúl Prebisch remains one of the least well-known and most controversial ﬁgures in the history of economic ideas. In his native Argentina he is stillseen as a conservative technocratic economist working for the interests of foreign powers, while abroad, particularly in the United States, when his name is recognized, it is often associated with the forefather of the Marxist Dependency School. This is in part the result of the complex evolution of politics in Argentina and the world during the twentieth century, which makes it very difﬁcult to classify the ideas of an original and multi-faceted thinker like Prebisch. It also reﬂects Prebisch’s often contradictory positions on policy, particularly in Argentina."